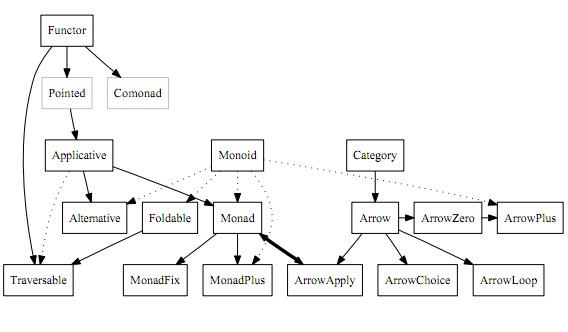 Relationships among standard Haskell type classes, Figure 1 as published in Typeclassopedia. current 14:16, 4 July 2017 753 × 260 (16 KB) Byorgey (talk | contribs) Better edge styling Monad--ArrowApply. 22:51, 18 October 2011 568 × 332 (25 KB) Drb226 (talk | contribs) Relationships among standard Haskell type classes, Figure 1 as published in Typeclassopedia. This page was last modified on 4 July 2017, at 14:16.